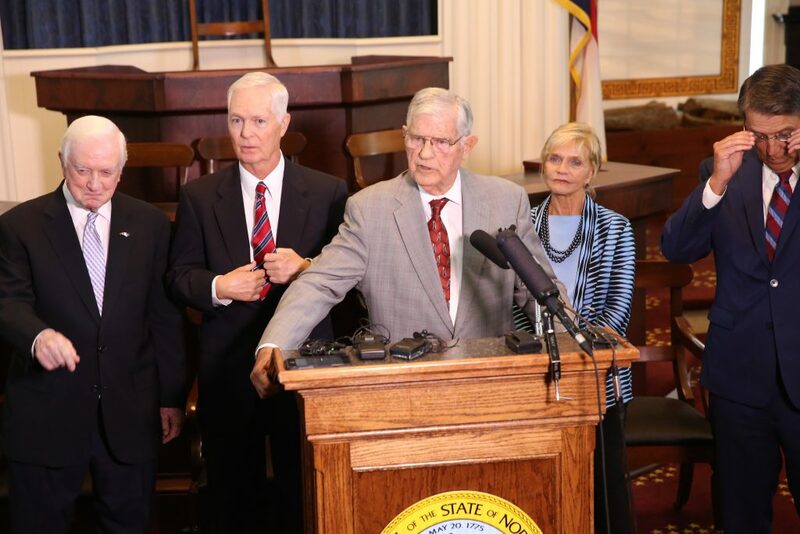 Martin, and the four other living former North Carolina governors, held a news conference Monday, Aug. 13, in the State Capitol building, standing in bipartisan opposition to two constitutional amendments they say would limit executive power. “The symbolism here in the House Chamber is palpable — that means you can feel it,” Republican Martin joked. Martin said he arranged the meeting with his colleagues Jim Hunt, Mike Easley, Beverly Perdue, and Pat McCrory, because they agreed the proposed amendments — House Bill 913 and Senate Bill 814 — would damage separation of powers. They also would shift too much control away from the executive and judicial branches of government to the legislature. The governors planned to meet with political strategist Paul Shumaker to discuss ways to oppose the amendments, including the possibility of forming an official committee, raising money, and running ad campaigns. They also urged media outlets to inform the public about the amendments and let voters make up their own minds on the measures — though Perdue added she wanted voters to reject them. Democratic Gov. Roy Cooper filed a lawsuit challenging the two amendments. He argued the ballot questions are misleading, unfair, and incomplete. His lawyers say they’re unconstitutional because ballot questions must accurately describe the effect of the amendment. H.B. 913 creates a new eight-member Bipartisan Board of Ethics and Elections Enforcement appointed by the legislature and outside the authority of the executive branch; it also wrests authority for making other board and commission appointments from the governor to the legislature. S.B. 814 deals with filling judicial vacancies. It creates merit commissions to recommend judicial candidates to the General Assembly, which would make nominations to the governor. Senate leader Phil Berger, R-Rockingham, and House Speaker Tim Moore, R-Cleveland, issued a joint statement responding to the governors. Hunt served four terms as governor — 1977-85 and 1993-2001. He said the amendments would be bad for North Carolinians, who choose the governor in a statewide election with the expectation he or she will represent their interests through board appointments. Easley reiterated the significance of the meeting. Easley said the amendments would be bad for regulatory policy. Easley said that, from his perspective as governor, attorney general, and lawyer, the amendments were poorly drafted and warned it would take years for the courts to interpret them. Perdue said she was surprised by news of the legislature’s ongoing session and its plans to implement the amendments after the elections. Perdue, a former history and civics teacher, said even fourth-graders understand the concept of checks and balances among the three branches of government. Republicans McCrory and Martin agreed this constitutional issue went beyond partisan politics. Failing to engage the GOP-led General Assembly would be hypocritical, McCrory said, recalling his successful battle in the separation-of-powers lawsuit McCrory v. Berger. In the lawsuit, the state Supreme Court ruled the governor had to have effective control of a majority of the appointees of a board or commission which primarily performs executive branch functions. McCrory challenged legislators to join the governors in opposing the amendment. “Don’t hijack our constitution, especially through two deceitful and misleading amendments that will be on the ballot and attempt to fool the people of our great state,” McCrory said.